There are no work restrictions for the previous day and no diet restrictions. Patient should have healthy normal diet. Alcohol must be avoided on the day prior to procedure and restricted for 3 weeks prior to 90 ml per day or less. Smoking should be stopped completely from 3 weeks ahead for best results, if this is not easy then it should at least be restricted as far as possible. Smoking hampers best results. Patient should shampoo his hair the day before the procedure with normal shampoo. If some portion of hair is greyed (whitened), then there is no need to dye the hair as only the black hairs will be taken. If majority of hair is greyed or whitened, then it is preferable to dye the hair so that hair can be taken easily. Ask your doctor whether or not to dye the hair if you dye hair regularly. Cash for payment must be readied. Payments have to be made in cash and in advance before the procedure starts. There will be no time to take it out from the ATM on the day of the procedure. Patient must have the cash ready when he reaches the OT the next day. If installment payment is being planned, then patient must sign the agreement for installment payment on the day prior to the procedure. The patient must go to the Hospital on the day prior to the procedure and take required documents along with him which includes salary slips, photostat copies of identity proofs, cheque book, etc. 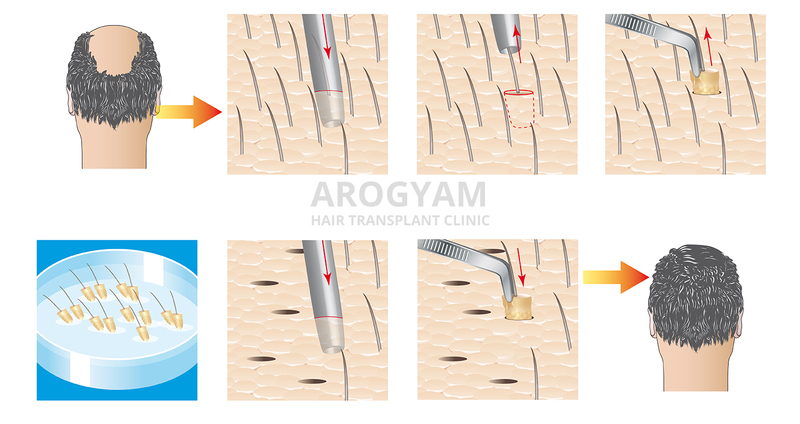 Please check the page cost in hair transplant for the requirements for installment payments. All investigation reports which are advised for the procedure must be readied if they have not already been reviewed. If investigations have been done in Downtown hospital or Arogyam, the reports can be collected by our staff. If they have been done outside, the reports must be collected and checked against reference values to see whether they are normal. Reports must be produced before the procedure starts. Attendants (accompanying persons) are not a must for the procedure. Most patients come alone for the procedure. However it is desirable that an accompanying person should be there with the patient which helps to reduce stress for the patient. Attendants should be told beforehand to be ready at the proper time. Attendants need not wait outside the OT during the procedure as it will be a day long procedure, after initial discussions with the doctor the attendant can leave for his own work and can remain in contact over the phone. If there is no attendant, an emergency contact number of someone in Guwahati should be arranged for the day of the procedure. Patient must have full normal breakfast on the morning of the procedure. He must carry with him a cloth cap to wear on the way back. He must take along the investigation reports with him. He should also have ready the cash payments as discussed. He should wear a buttoned shirt rather than a T-shirt which may cause problems while putting on after the transplant. Food or drinking water need not be taken along as these will be available in the hospital. Patient is required to reach Downtown hospital, Building no 1 at 9 AM sharp. If registration in the hospital has not been done previously, then registration must be done at the reception. Registration fees is Rs 100. Pt is then directed to the OT which is on the 2nd floor. Patient's weight is taken, BP is measured and Xylocaine sensitivity test is done. 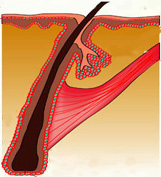 A gel is applied in the area of the transplant. Patient is also asked to take 2 painkiller tablets and a tablet for acidity. This will be supplied by staff. Patient must then sign the consent form. General consent form of hospital OT is supplied and no special consent is required for hair transplant. Patient then changes into the OT patient dress. The doctor and patient then again review the plan for the transplant. The number of grafts to be transplanted, the area where the hairs will be planted, general line of the hairline, etc are discussed. Patient then makes full payment according to the number of grafts that are to be done. Full advance payment must be paid as agreed upon prior to the procedure. Payment should be in cash. This is the hospital protocol. Procedure will start only after payment is made. Photographs of the patient's bald areas from a few different angles are taken. These photographs are only for patient record and are required by law for all cosmetic surgery. They will not be published in media or online. Then comes the all important task of drawing the hairline. The patient reviews the hairline and only when both the patient and the doctor are satisfied with the hairline, it is finalized. The grafts will be given according to this hairline. Patient's hair is then trimmed. Hair is trimmed to 3 mm which is the approx length at which army people keep their hair. The patient then lies down on his back and the plantation area is scrubbed with antiseptic solution. Local anesthetic injections are then given in the front and other areas where the hair is to be planted. This completely anesthesizes the skin and the patient will not feel any pain during the procedure. Slits are then made in the areas where hair will be planted. Slits are very small and hardly visible to the naked eye. The number of slits is equal to the planned number of grafts. The surgeon makes the slits according to the plan of the transplant. They are directed according to the natural direction of hair. Once slits are completed, the patient lies on his stomach. A gel pillow is used to place the head and face. The donor area at the back of the head is then scrubbed. Local anesthetic injections are then given at the back of the head. The surgeon the begins the process of FUE. The number of grafts that are taken out at one time depend on the number of grafts to be done during the day. If 2000 grafts are planned for the day, for example, usually 1000 grafts will be taken out at one time. The patient then again shifts his position and lies on his back. The grafts which have been taken out are immediately planted into the slits by the staff assistant. This minimizes the out-of-body time. Working lunch is then served for patient and staff. In the afternoon, the same routine of taking out grafts and then plantation is followed to complete the process of transplant. Once the process is completed, the area is then cleaned and a bandage is given at the back of the head. The patient then changes back into his normal clothes. The patient can now wear the cap he has brought so to cover the signs of the procedure on the way back. The doctor now explains the medicines to take and protocols to follow. Antibiotics and painkillers have to be taken for 7 days. The patient can bathe from the next day and wet his head also but shampooing is to be started after 4 days. No dietary restrictions but smoking and alcohol is to be avoided or restricted. No other special precautions are needed. The patient can then go back home. He can join work from the very next day.